STAR TRACE's Manufacturers , Suppliers and Exporters of Electromagnetic and permanent Magnetic Pulleys and industrial conveyor magnets provides effective way to remove ferrous contaminant from powdery, schistose and granulate material, like ore, coal, waste, sand and etc. 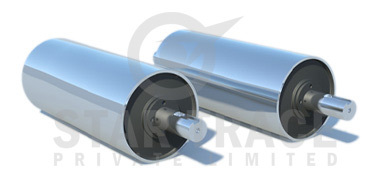 Magnets Roller used as industrial conveyor magnets is composed of 360 degree magnetic core protected by rotatable stainless steel thick cover made of ss304 cover and a axis of rotation.these items have extremely powerful in Electromagnetic and magnets force in industrial conveyor magnets roller applications. As Permanent Magnetic Head Pulleys For Belt Conveyor Manufacturers and exporters, our aim is to provide the highest quality Permanent Magnetic Head Pulleys For Belt Conveyor while remaining the most reliable supplier for magnets globally. Our range of Magnetic Head Pulleys For Belt Conveyor extends from Permanent Magnetic Head Pulleys For Belt Conveyor to Electromagnetic pulleys sand Permanent Magnetic Pulleys, including Rollers for Conveyor. The Permanent Magnetic Head Pulleys For Belt Conveyor provide efficient ways in removing ferrous contaminants from powdery, Granulates materials like ore, coal, waste, sand etc with the help of magnets. The Permanent Magnetic Head Pulleys For Belt Conveyor comprised of a 360 degree magnetic core protected by a rotatable stainless steel cover and an axis of rotation. Surface of the Permanent Magnetic Head Pulleys For Belt Conveyor which contains the magnets will be wrapped by belt in order for the materials to flow over it. Ferrous contaminants are attracted at the belt through the magnetic field created by the magnets inside while the material is conveyed. It's possible to replace an existing head pulleys with a Permanent Magnetic Head Pulleys For Belt Conveyor, on a size-for-size basis. A wide range of diameters, widths, and shaft sizes are available for Magnetic Head Pulleys. Permanent Magnetic Head Pulleys For Belt Conveyor contains three types of strength Light duty, Medium duty and heavy duty Magnetic Head Pulleys. Industrial Magnetic Head Pulleys for belt conveyor are built using our exclusive flux control magnetic circuit. This design ensures continuous magnetism around the entire circumference of the pulleys-no dead spots. For less critical applications, a conventional magnets circuit design is also offered. Light duty:For general use with burden depths up to 50mm. Belt speeds to 1.8m/s. Good for secondary Clean up of misc. tramp iron and fines. Medium Duty:For general use with burden depths up to 75mm. Belt speeds to 2m/s. Used in Construction & Demolition and Material Recovery Facility. Heavy Duty:For general use with burden depths up to 100mm. Belt speed to 2m/s. Used in Mining, Foundry, and Heavy Duty. The Permanent Magnetic Head Pulleys can be installed easily at conveyor discharge. They give complete magnets protection over the entire face of the roller for removing ferrous contaminants. The Permanent Magnetic Head Pulleys either use ceramic magnets or powerful rare earth magnets. Maximum magnets induction on the roller's surface is selected within the range of (1000-4500). Optimal conditions for separation are created due to the minimized distance between material and separator's effective surface. Unique pulleys systems are composed of powerful Rare earth magnets. Magnets are thoroughly tested to ensure that the required properties are present and to guarantee long equipment life and high performance. Magnetic head Pulleys for belt conveyor come in different sizes, various diameters and widths are available on request. Shaft dimensions are to customer specifications. Four available Hub styles, Recessed Hubs, Flush Hubs Extended Hubs, or, No Hubs. Taper lock on some models, call factory to verify. Axial/Radial/Multi pole magnetic circuit design. Heavy duty stainless steel shell. Uniform depth of field on face of pulleys. Flat or Crowned Roller Face. Taper Locks and Set Screws. Fixed Shaft or No Shaft. Protect processing equipment like crushes, grinders, pulverizers, screens and other processing equipment from ferrous metal damage. Increases product purity in food, chemicals, plastics, glass by removing unwanted iron. Cost effective separation for material depth. Excellent for secondary separation after an overhead or drum magnets. Star Trace Pvt. Ltd. is a prominent Manufacturers and Suppliers of magnetic and vibrating equipments industrial conveyor magnets used in various industrial applications. We are Manufacturers , Suppliers and Exporters a wide galore of industrial equipments such as Magnetic Roller, Rare Earth , Permanent & Electromagnet Roller,Pulleys and so on. We are Specialized in fabrication of industrial conveyor magnets for 25 years and this enables us to be a leader in this field.we are Manufacturers , Suppliers and Exporters having an ISO 9001 2008 company and listed in D & B for confidence. Our aim is to remove iron particles using magnets in process line to protect costly machinery and purify the process line for industrial conveyor magnets applications.we Manufacturers to provide combination of several equipments to archive this mission for conveyor magnets applications.